“I’ve got a surprise for you,” Mark said, leaning toward me across the table. In the warm candlelight of the restaurant, he looked like a movie star. “A surprise?” I asked nervously. Lately, his passion for me had been cooling, and we’d seen less of each other. I’d been devastated at the thought he was losing interest, and I hadn’t been sleeping well. I watched Mark, waiting for him to burst my bubble. He’d said these words before, but they’d always been neutered when he added “next year” or “in a few months.” We’d been dating for three years, during which my heart had seesawed up and down as my hopes rose and ebbed. I’d finally admitted to myself that he’d never leave his wife, that I was just like all the foolish lovers who believed a cheater’s promise. Only it suddenly seemed that I had him all wrong. 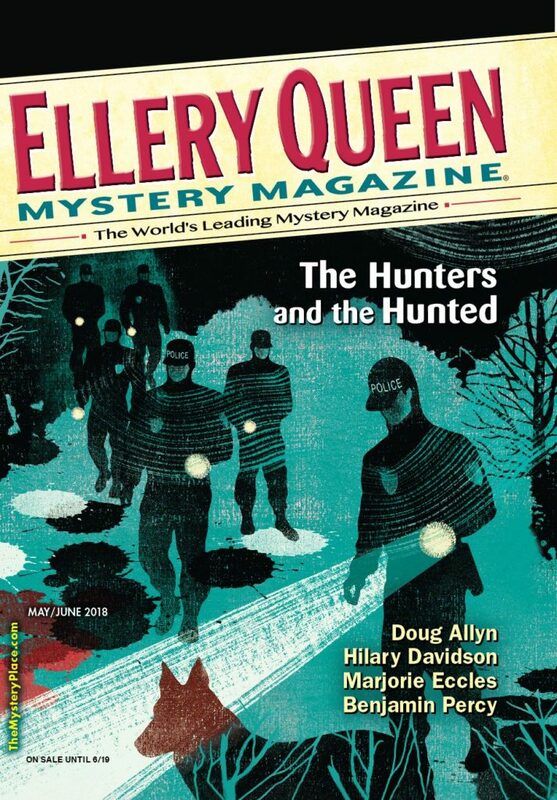 If you want to read more, the May/June 2018 issue of Ellery Queen is on newsstands now. You can also buy the issue online… but why not get a subscription? 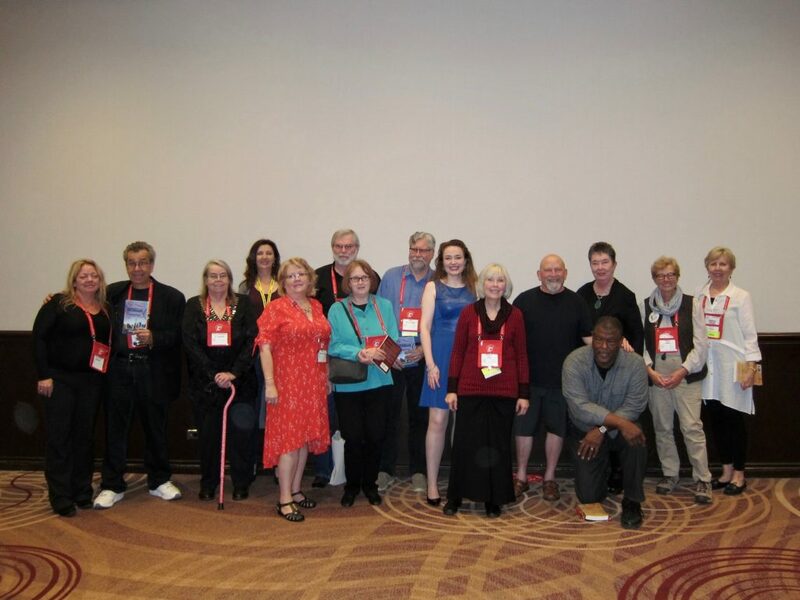 I have not one but two thrilling pieces of news: my story “Jerusalem Syndrome” is up for an Arthur Ellis Award from the Crime Writers of Canada… and my story “My Side of the Matter” is up for an Anthony Award! I couldn’t be happier or more grateful. 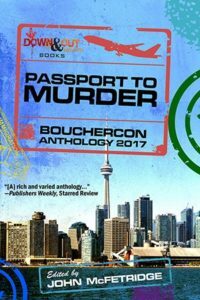 Short stories are my first love, and I’m honored that these two are getting so much attention, especially because they were written for anthologies dedicated to raising money for charity: “Jerusalem Syndrome” appears in Passport to Murder: Bouchercon Anthology 2017, with proceeds going to Frontier College, and “My Side of the Matter” appears in Killing Malmon, which raises funds for the National Multiple Sclerosis Society. My thanks to everyone who has supported these causes! 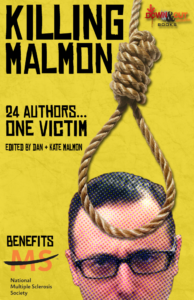 Also, congrats to Dan and Kate Malmon, who are also finalists for an Anthony Award for the Killing Malmon collection. 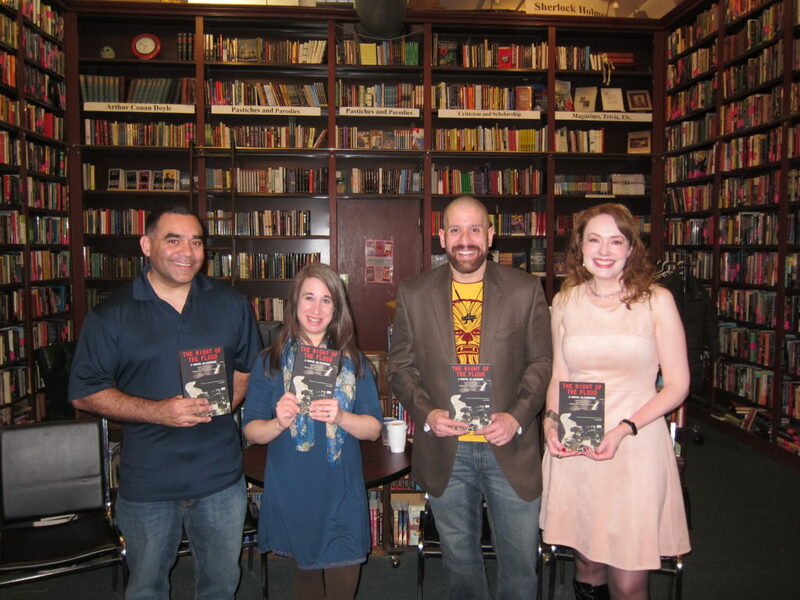 We had a launch party for THE NIGHT OF THE FLOOD last Thursday at New York’s landmark Mysterious Bookshop. It was the day after a nor’easter hit, so three of the authors who’d planned to be there couldn’t make it in. But Ed Aymar, Angel Luis Colón, Jenny Milchman, and I were there, and we had a great Q&A and signed a big stack of books. If you’d like to buy one, please get in touch with the Mysterious Bookshop! There are several new reviews and articles I want to share, starting with Ed Aymar’s terrific column in the Washington Independent Review of Books. Ed asked Shannon Kirk, J.J. Hensley, Gwen Florio, and me to talk about the societal issues that influenced out stories. Want to know what inspired me to write about domestic violence in “The Darkest Hour”? Learn about our fictional town of Everton, PA — and win a copy of the book — over at Fresh Fiction. Finally, Angel Luis Colón, Nick Kolakowski, and I are doing a reading at Kew & Willow Books this Friday night at 7pm. Hope to see you there! 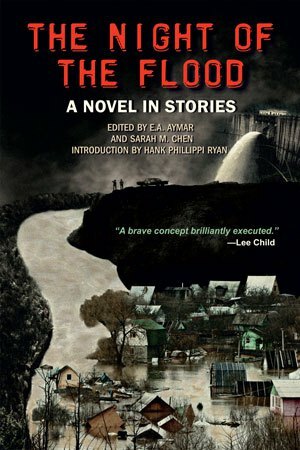 Please join me in welcoming THE NIGHT OF THE FLOOD to the world! This collaborative, noir-infused novel was truly an honor to be a part of. Thank you to E.A. (Ed) Aymar and Sarah M. Chen for being editors extraordinaire, Hank Phillippi Ryan for her beautiful introduction to the book, and to my coauthors Rob Brunet, Angel Luis Colón, Mark Edwards, Gwen Florio, Elizabeth Heiter, J.J. Hensley, Jennifer Hillier, Shannon Kirk, Jenny Milchman, Alan Orloff, and Wendy Tyson. A better group of co-conspirators would be impossible to find! You know you want this book! Hope to see you at Thursday’s launch party at New York City’s Mysterious Bookshop. You know who’s a terrific interviewer? Eric Beetner. Ditto for S.W. Lauden. 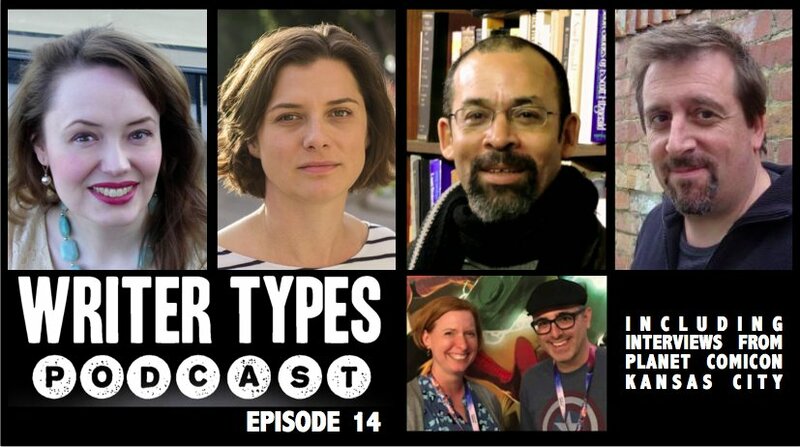 Their Writer Types podcast is a lot of fun, and I was lucky enough to be interviewed on it. I talk about THE NIGHT OF THE FLOOD (of course) but somehow we also get around to raising a zombie army led by Eleanor of Aquitaine. Take a listen. The early reviews have been exciting. Lee Child called the book “A brave concept brilliantly executed.” BOLO Books said it was “An impressive collection of stories from some of the most talented writers working in the crime genre today.” (BOLO Books made my day by saying this about my story, “The Darkest Hour”: “This mini domestic thriller about a mother who will do anything to keep her children safe is a fast-paced and action-oriented story. I am loath to choose a favorite in this collection, but there is not denying that Davidson’s story is a real highlight.”) For more details, or to order the book, click here. There will be a couple of events to celebrate the release of THE NIGHT OF THE FLOOD in New York. On Thursday, March 8th, we’re having a party at The Mysterious Bookshop (58 Warren Street in Manhattan) starting at 6:30pm, and you’re invited. There will also be a reading at Kew & Willow Books (8163 Lefferts Blvd in Queens) on Friday, March 16th; again, all are welcome. If you can make it, I’d love to see you! 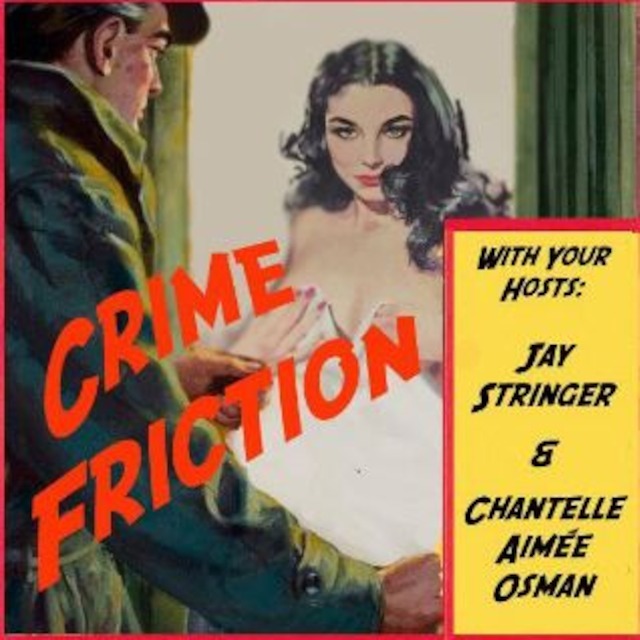 Two talented friends — author Jay Stringer and editor/writing teacher/rabble-rouser Chantelle Aimée Osman — have started a terrific new podcast they’re calling The Defectives. I’m the featured guest on the latest episode, and you can here me jaw about exotic animals I’ve eaten, shameless eavesdropping, and modern anxieties. But the real reason to listen is Todd Robinson’s son, Sam, who also makes an appearance in the podcast. Download it now! New Year, New Book Deal! Anthony Award winner Hilary Davidson’s ONE SMALL SACRIFICE, in which an NYPD detective searches for a missing doctor whose fiance is suspected of killing another woman a year earlier, to Megha Parekh at Thomas & Mercer, in a two-book deal, by Mitch Hoffman at Aaron Priest Literary Agency (World). I’ll have plenty more to say about this in the coming months (ONE SMALL SACRIFICE is slated for release in early 2019), but for now, I hope you’ll celebrate with me! Suzanne Horne fell in love with Tel Aviv at first sight. She’d dreamed of visiting Israel for years, long before she and her husband joined Pastor Ted’s church. The long series of flights—from Houston to Chicago to New York to Tel Aviv—hadn’t sapped her energy, or her enthusiasm. From the air, the city glittered like a jewel at the edge of the Mediterranean. Up close, on the bus drive in from the airport, she was just as impressed. Every way she looked, there were palm trees and names that resonated with Biblical weight along with modern skyscrapers and a palpable sense of energy. Of course you remember that, Suzanne thought. You’ve gone on Pastor Ted’s Tour of the Holy Land every year! Then she caught Mercy’s eye and felt guilty. The girl gave an uncertain nod and her eyes slid to the ground. Minday might be a piece of work, but her daughter was never anything but gentle and shy. “Exactly, Minday. All right, everyone. Tonight we have dinner and prayer circle,” Pastor Ted said. “Do we have time to take a short walk on the beach?” Suzanne asked. She could already imagine soft sand under her feet while the Mediterranean lapped at her toes. Suzanne wasn’t ready to give in. After four years of waiting for a spot to open up on Pastor Ted’s annual Tour of the Holy Land, she and her husband, Bobby, had snagged spaces thanks to their work on—and donations to—the presidential campaign. It wasn’t that Pastor Ted was a big fan of the candidate—behind the scenes, he referred to the man as a Mormon moron—but certain services were expected if you wanted to rise in that circle. While Bobby thrived in that environment, Suzanne struggled to fit in. “What time, exactly, is Prayer Circle?” Suzanne asked. Pastor Ted shot her a look that telegraphed what a patently foolish woman she was. “If you wanted to walk on the beach, Suzanne, you should have gone to California for Christmas.” The tone of his voice was soft but there was steel under it. “With all the sinners bound for hell,” Minday added. “It looks so beautiful…” Suzanne mumbled. Suzanne’s shoulders slumped. She was always putting her foot wrong around the church crowd, especially Pastor Ted. Publishers Weekly gave PASSPORT TO MURDER a starred review, and it singled out “Jerusalem Syndrome” for praise. I hope you’ll pick up the collection. In case you need any added incentive, all proceeds go to the literacy organization Frontier College.